"The InvoTech Laundry System has many special features and powerful reporting capabilities for managing all aspects of laundry operations." InvoTech Systems Inc. announced the recent implementation of its Laundry System, by Metro Laundry Service, in the Washington DC area. A new MLS plant capable of processing over 14 million lbs. of textiles annually. InvoTech Systems is the leading provider of advanced Linen Management, Laundry and Uniform Systems that integrate the latest RFID technology to increase profitability for industrial laundry operations, and hotel and hospital laundries. The InvoTech Laundry System installed at Metro Laundry Service interfaces with the InvoTech Linen System for the most complete laundry inventory tracking. In addition, the InvoTech Laundry System integrates a comprehensive rental system for linens and uniforms. Click here for more information on InvoTech’s Linen, Laundry and Uniform Systems. “InvoTech’s solution maintains an accurate, real-time inventory of all items that ensures 100% control of our customers’ linen items. The system has many special features and powerful reporting capabilities for managing all aspects of laundry operations. The system also automates recordkeeping, which eliminates manual errors. 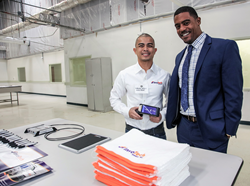 InvoTech’s state-of-the-art technology suited to servicing the luxury, brand hotels use the latest in radio-frequency identification (RFID) technology to track each individual item”, said Steven Young, COO of Metro Laundry Service.